There are several Thai boxing gyms on the island, but we can recommend our friends and neighbours at Muay Thai Chinnarach. A family-run, friendly gym with training for all abilities from beginners to experienced fighter. It’s a great way to get fit, lose weight and meet new people! Koh Phangan is a popular destination for those interested in body, mind & spirituality. There are many yoga schools on the island which offer a range of courses from daily drop-in sessions for beginners right through to full yoga teacher training. Koh Ma and Mae Haad have a variety of corals, reefs and tropical fish and are perfect for both dives and snorkelling. Phangan is also close to premier dive spots in the Gulf of Thailand such as Sail Rock and Ang Thong National Marine Park are within easy reach of Koh Phangan. There are several dive schools and operations to choose from. Indulge yourself at one of the many spas offering beauty treatments and massages. Prices are cheap compared to salons in the West – get a genuine Thai massage for a fraction of the cost back home. Thai food is popular around the world and you can learn how to cook it during your holiday. A range of short courses which include a trip to the local market are available. Pick up a copy of Phangan Info when you arrive for a listing of schools. Most of Phangan’s tropical jungle is untouched, making it a great place to to go trekking. Be warned – some of the walks can be tough as they are steep and the jungle is hot and humid – but they are great fun! Find out more about the island’s trekking routes. The islands waterfalls are in their full glory after the rainy season in Oct-Dec. However, they are still worth a visit all year round for the stunning natural scenery, especially Taan Sadet and Pheang waterfalls which are both set in national parks. Several massage schools on the island teach this ancient art. Courses vary in length, depending on how expert you would like to be! Take a long-tail boat tours around the island or a day trip further afield to Ang Thong National Marine Park. Trips usually offer opportunities for snorkelling and offer lunch, snacks and drinks. There are also operators offering sailing and big game fishing. 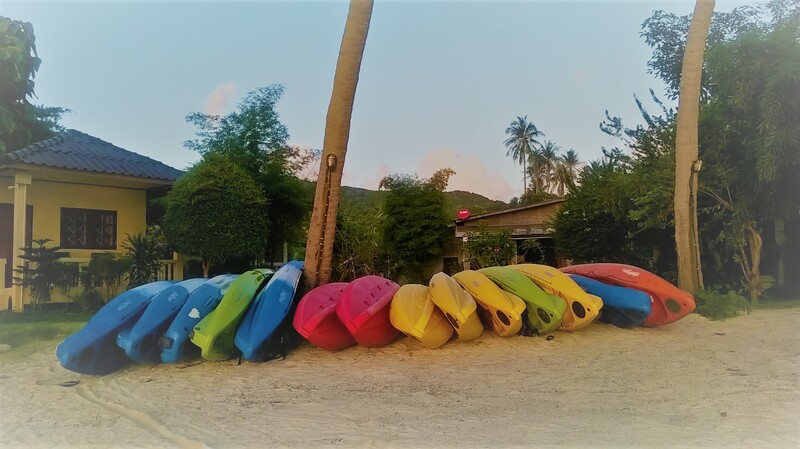 This is just a small selection of activities available on Koh Phangan. Details are correct at the time of writing, but things can change so check out Phangan Info and We Love Koh Phangan to see what’s new! Prices start from 2,400 per night for 4 people. Discounts available for bookings of 1/2/3 weeks & monthly bookings. We can also arrange Muay Thai training for you. Contact us now!